So simple that I didn’t even take photos of the ‘process’ or making them. 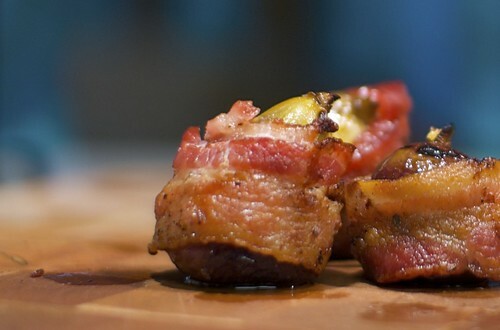 You take bacon, you take figs, and you wrap the figs in the bacon, then grill over medium-high heat until the bacon crisps. 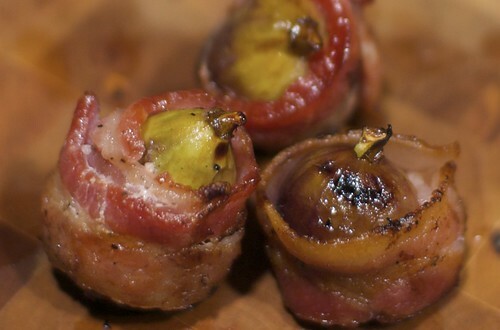 I actually tried this with dried figs, stuffed with gorgonzola cheese, only to find I hate dried figs. Fresh figs, however, are a different story… they’re GREAT!!! And, once wrapped in bacon and grilled, even greater! 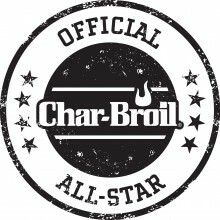 If you’re ever in Chicago, you can get this as an app at the ‘Lucky Strike Lanes’ in River East. they went for the cheese along with. Sorry it took me a while to respond to your comment, but thanks for coming by. I looked up the menu to Lucky Strike Lanes, and that’s certainly a different bowling alley than I’m used to! Too bad one isn’t closer to me.